SF Village. This new Village is located in the Huay Yai Area. It consists of only 12 homes all with a private swimming pool and a very nice sized landscaped garden . The Village is approximately 15 minutes’ drive to Pattaya City. 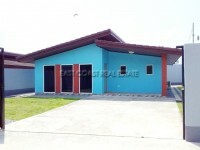 This modern home is a 2 Bedroom house with a living space of 160 sqm. The house comes with a European Kitchen and 3 fitted bathrooms. At this price it will be sold unfurnished, however there will be Air Conditioning for each room included FOR FREE! As this is the first house to be complete the developer wishes to offer it for sale at the very reasonable price of 3,550,000 Baht in Thai or Thai Company Name. With Tax and Transfer to be split 50/50 between BUYER and SELLER.